Allison and Craig Knizek struggled for 10 years over how to expand their 2,650-square-foot home in Sherman Oaks, Calif. Then they found the solution: Rather than increase the footprint of their existing home, they decided to build another one. The Knizeks finished construction last year. Built for $300,000, their 789-square-foot guesthouse has an A-frame structure with an 18-foot ceiling in the living room and bi-fold doors that open onto a fire pit and a pool. This guesthouse isn’t just for guests, though: The couple and their children often occupy the space themselves, using it both as an office and for entertaining. They often find themselves fighting over it. Tami Pardee, a real-estate agent in Venice, Calif., says that about two years ago, she was seeing developers build homes with guesthouses instead of duplexes designed for two families. Guesthouses are even appearing in densely populated Manhattan, though instead of offering two homes on the same lot, developers pitch two apartments in the same building. At Walker Tower, a condominium building in Chelsea, real-estate firm Douglas Elliman is marketing a 6,738-square-foot full-floor penthouse with a 1,356-square-foot „guesthouse unit“ on a lower floor, for a combined price of $51.5 million. „We kept hearing people say they loved the full-floor penthouse, but wouldn’t it be great if it came with a separate guest unit for friends, a home office or a nanny,“ says Vickey Barron, Walker Tower’s director of sales. Exact statistics on guesthouses are hard to come by, which also helps explain their popularity. Unlike most primary homes, many guesthouses are built without a permit, making them more difficult to keep track of and easier to erect. Adding on to a main house without a permit could complicate any eventual sale. A guesthouse built without a permit would have to be disclosed as such to prospective buyers, but it could also be easily torn down in a worst-case scenario—something that isn’t usually an option with a primary home. And as the type of owners who build guesthouses change, so does the way guesthouses are used. These days, they often do everything besides housing guests. Sometimes, they are home offices. The number of Americans working from home at least part of the time soared more than 45% from 1997 to 2010, according to a recent Census Bureau report. Sometimes, they’re for Junior: One in five people in their 20s and early 30s live with their parents now, compared with one in 10 a generation ago, according to the Census. Guesthouses offer a less infantilizing option than the childhood bedroom. 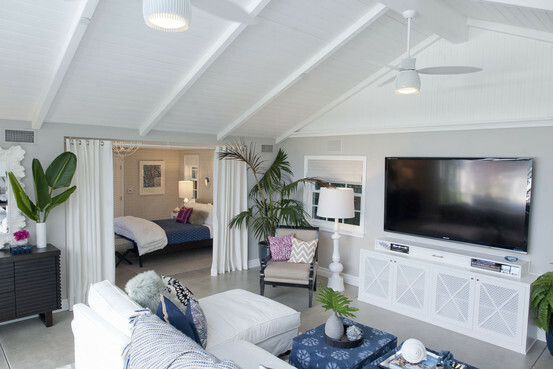 Reacting to consumer demand, the New Home Co., a home builder in Irvine, Calif., started making detached guesthouses a significant part of its developments about two years ago. At the developer’s newest Irvine property, the Amelia and Trevi neighborhoods in Orchard Hills, homeowners have the option to add a 500- to 700-square-foot guesthouse to their property for about $200,000. The main homes range in cost from $1.7 million to $2.8 million. „People want a place for their parents or college-age children to stay,“ says Joan Marcus-Colvin, who runs sales and marketing for the New Home Co.
Then there is the recent run-up of the rental market. Rents are rising in major metropolitan areas across the country, making leasing out a guesthouse a tempting option. Guesthouse owners and real-estate agents say the emergence of online lodging sites, such as VRBO and Airbnb, has also made it easier to turn a guesthouse into a source of extra income. Constantine Vlahos, a former day trader, now makes extra income renting out his guesthouse in Los Angeles. Mr. Vlahos bought a Mediterranean Revival-style main residence in 2000 for just over $1 million and spent $2.5 million—and five years—renovating it, adding a 750-square-foot guesthouse with a 35-foot pool and gardens. The guesthouse has floor-to-ceiling glass doors, marble and stone floors, views of downtown as well as a big stone fireplace, kitchenette and king-size bed. In 2008, Mr. Vlahos began renting out the guesthouse, and since then he says he’s hosted dozens of marriage proposals and elopements and many celebrities. He says the guesthouse is occupied about 80% of the time at a cost of $395 a night, nearly 50% more than when he first started renting it six years ago. A month-long stay costs $9,480. Natasha Nekrasova, a 38-year-old lawyer, paid just under $3 million for a modern, glass-walled, 2,500-square-foot home in Venice, Calif., earlier this year. She says one of the big incentives to buy the property was its 1,000-square-foot, two-story guesthouse, with exposed steel beams and French oak floors. „We bought the house for the guesthouse specifically, because we knew we could rent it out on Airbnb,“ she says, adding that she doesn’t mind sharing space with strangers because the guesthouse is separate, with its own kitchen and parking area. Real-estate agents say guesthouses, even unpermitted ones, can significantly increase the value of a property. „Adding a guesthouse is a great way to differentiate a property, and it can often add 20% to the value of a home,“ says Jason Rodriguez, a builder of high-end properties in Los Angeles. He says that owners always recoup construction costs when they sell. Some guesthouses are being used as homes away from home. Rochelle Gerson, a 53-year-old business-affairs executive at HBO, and her husband several years ago spent about $250,000 to renovate the 600-square-foot guesthouse on their 1-acre property in Encino, Calif., and to build a pool. Now Asian-inspired with a beach feel, the guesthouse has blue slate floors, vaulted white ceilings and skylights. There are homeowners who are still using their guesthouses for their guests. Valerie Giraud’s 2,400-square-foot guesthouse, which has French doors, a stone exterior and a large porch, sits about 70 feet from her 5,000-square-foot main residence on a cliff overlooking the ocean in Malibu. She says friends or artists often stay in the space.